POD-dy Mouth: The 2005 Needle Award Winners! The 2005 Needle Award Winners! And the winners of the 2005 Needle Awards are . . .
Congratulations to both Mike and Brian! Here are some comments from the judges . . .
"This book was laugh-out-loud funny. And it's got St. Martin's written all over it. Too bad I edit memoirs and self-help. Maybe it's time for a career change." "A gem, totally engrossing and funny. Judging aside, it was a pleasure to read this book. It's a keeper." "If Carl Hiaasen is looking in his rear-view mirror, that's Mike Vogel he sees fast approaching. What a dynamite little novel." "Brian Agincourt Massey has written an unparalleled piece of literature here. From the first page to the last, one word will return to your mind: lovely." 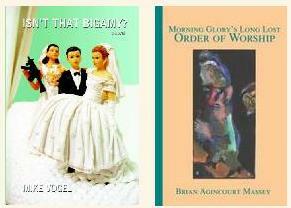 "Holy cow, [Brian Agincourt Massey] is a wordsmith. Slap a Knopf or Viking logo on this and I'd be paying $22.95 for it at Barnes and Noble. What voice!" "This is one tight novel--error free and perfectly edited--and an absolute treat to read. A marvelous effort." And thanks to all the folks who helped this effort, from writing the books to judging them to taking a look at the winners. It's been a wonderful year. What do you get for your contest entry fee?